There is something sublime about the winter sunsets in Gastown. This piece depicts the view looking south across Alexander Street to the rooftops of East Hastings & Chinatown. Good to be here! The Vernon Drive Grocery has existed as an independent convenience store for over 100 years in Strathcona, and is a wonderfully evocative example of the kind of local mom and pop-type store that is gradually disappearing from neighbourhoods in Vancouver. Advertising murals were once pretty common across buildings downtown. This piece depicts the view down the alley at the back of the West Hotel towards the old BC Electric Railway Building on Carrall St. I was intrigued by the long composition and the sculptural element of the fire escapes. This depicts a cylindrical hopper car parked at the back of Portside Studios, originally tagged by Seko the Shogun Panel Assassin. This depicts the back of the Washington and Balmoral Hotels. Both are well-known SROs (Single-room Occupancy) social housing in the Downtown Eastside. This piece depicts the view looking westward from Abbott St in Gastown, along the alley between East Hastings & Pender. It features the remarkable utility pole & platform arrays typical of the area. This depicts a nocturnal view of the Hotel Pennsylvania sign, attached to the hotel of the same name at Pigeon park in Vancouver's DTES. It is a modern recreation of the historic original. I like living next to a working harbour & enjoy seeing the tugs moored by Crab Park in the Tymac Launch jetty. It is fun to watch their reflections of the early morning light in the water. The Main Mini Mart is a corner store in the DTES. It has the bars & plywood windows common to such stores in the neighbourhood, as well what seems to be the last payphone in the 'hood. 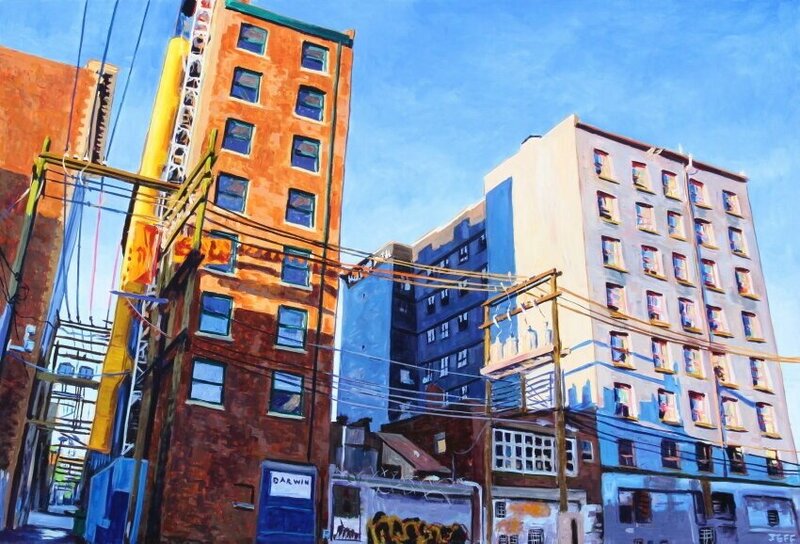 This depicts the back of the Cambie Hotel, in Gastown. I have walked through this alleyway many times and always been interested by the utilitarian beauty of this view. This piece depicts the Treasure Island Buy & Sell, a pawn shop at Pigeon Park in the DTES. These pawn shops have been a common neighbourhood feature for a long time, but have been gradually disappearing over the years.